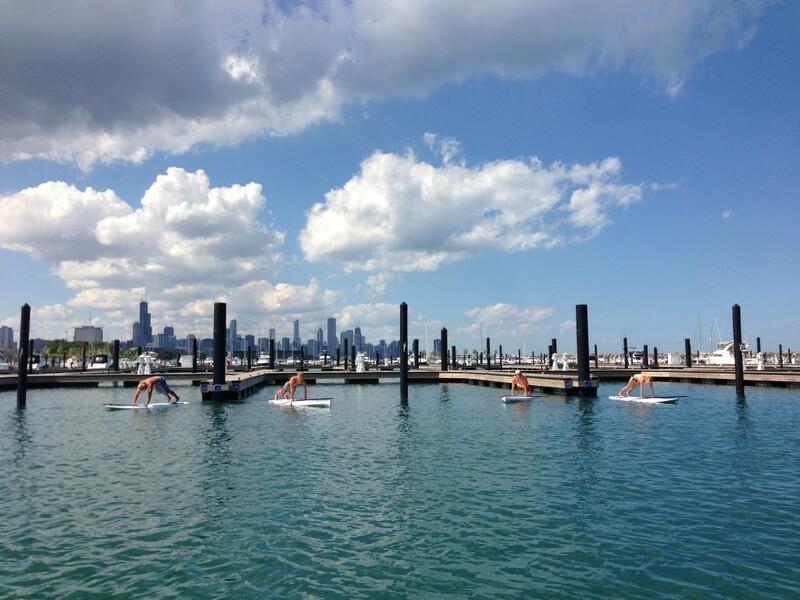 31st St Harbor is one of the best locations in Chicago for SUP and SUP yoga. The beautiful rock wall of the harbor shields against harsh lake conditions and the piers provide the option to tie the boards down during a yoga class. It’s a great, private, place to learn your SUP skills and a peaceful place to get into a SUP yoga practice. And the views? Fantastic. If Chicago ever asked you how it looked from behind, you could say, Niicceee. DIRECTIONS: Google it. Or, take the below with a grain of salt. Once you have arrived at 31st St and parked, you will make your way south towards the beach. The beach is next to the harbor. Keeping heading south (away from the beach and the public parking) along the harbor. You will walk down a path, alongside the boats (the boats should be on your left) until you see jet skis and the new pool area. We launch out of slip gate J-K-L which is right next to the loading dock. From the North end of Chicago: Get onto Lake Shore Drive and take it South. Take the 31st St exit. It will be on your right (about a quarter of a mile after the exit for I-55). Turn left off of the exit and you will arrive at 31st St beach/harbor. Public parking is to the left (along Lakefront Trail) and costs $1 per hour. From the South end of Chicago: Take US 41N/S Lake Shore Drive. Exit at 31st St. Turn right. 31st St beach/harbor will be in front of you. Public parking is to the left (along Lakefront Trail) and costs $1 per hour. Brown line to Madison/Wabash. Walk to Michigan & Madison/Monroe and transfer to the # 3 bus towards 95th St. Get off the #3 bus at 31st. Walk towards the water- about 1 mile. Red line to Roosevelt. Walk to Michigan and Roosevelt and transfer to the #3 bus towards 95th St. Get off the #3 bus at 31st St. Walk towards the water- about 1 mile. Red line to Roosevelt. Walk towards the water and follow the Lakefront Trail south until reaching 31st St Harbor. The walk from Roosevelt is beautiful and scenic but takes about an hour; best for good friends to chat, loners seeking solitude, or lovers holding hands and spilling their lives to each other. From the North: Take the Lakefront Trail South until reaching 31st St Harbor (if entering at Fullerton, take the trail past the beaches, wind through the tourists at Navy Pier following the trail, etc. etc). Stick to the paths and sidewalks so the lake is always on your left. It’s a beautiful ride and once you pass Burnham Harbor you’re in the home stretch! Plus, you even pass the Bird Sanctuary. From the South: Take the Lakefront trail North until reaching 31st St Harbor. I am unable to expound on this adventurous ride since I have never taken it…though Google has assured me that a biker only need to veer right and left and stay on the trail.